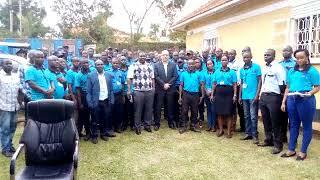 Kolping Microfinace Uganda Limited (KMF) is a Microfinance company of Uganda Kolping Society operating in three districts of Hoima, Mityana and Kibaale, with the head offices located in Hoima district adjacent to Uganda Kolping Society National Office. It was incorporated in September 2006 as a company limited by guarantee without share capital. Vision: "A Microfinance Institution that sustainably champions improved social economic lives of the people in Uganda"
Mission: "To build a sustainable institution that provides client focused quality financial services to micro-entrepreneurs for improved social economic livelihoods". (iii) Grow the clientele base and improve their livelihoods by providing easily accessible demand driven products and services, customer care, client protection and corporate social responsibility. (iv) Foster sound corporate image, prudent governance through adherence to our core values, timely quality reporting and compliance with statutory requirements. (c) 80% client retention rate maintained at all times. (a) 70% of the clients who access business loans are running successful microenterprises and making profits. (b) 100% of KEDEP clients' children of school going age are at school at all times.